Getting the hang of the steering! There are a lot of these kinds of groups out there at the moment and I’ve tried a couple. Socialising groups for those who want to meet new people and try new things. 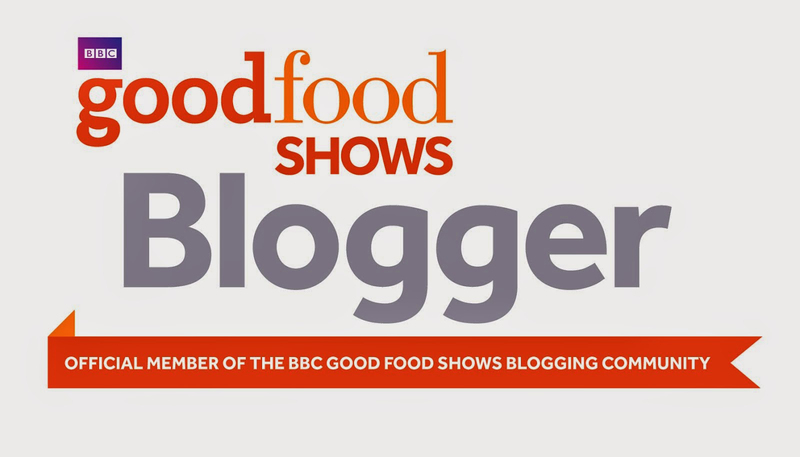 Whatever you’re into, you’re bound to find a group to suit – from restaurants to nights out or book groups and cinema trips – these type of groups are great for regular meet ups or just the occasional trip out. The uDare group is a little special as it gives you the chance to get out and try something different, from one day adventure activities to Everest treks and everything in-between! 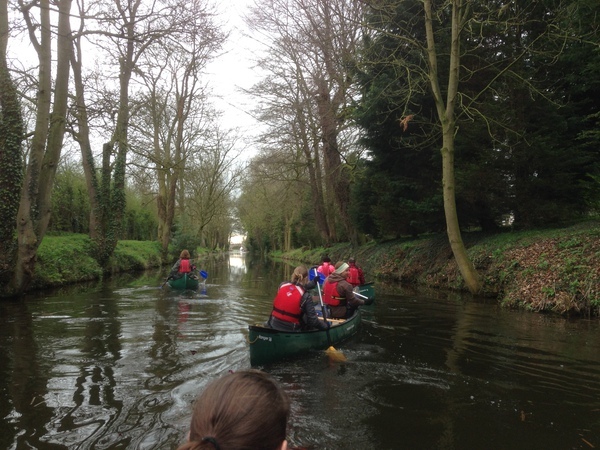 Canoeing through a narrow, sheltered part of the river. 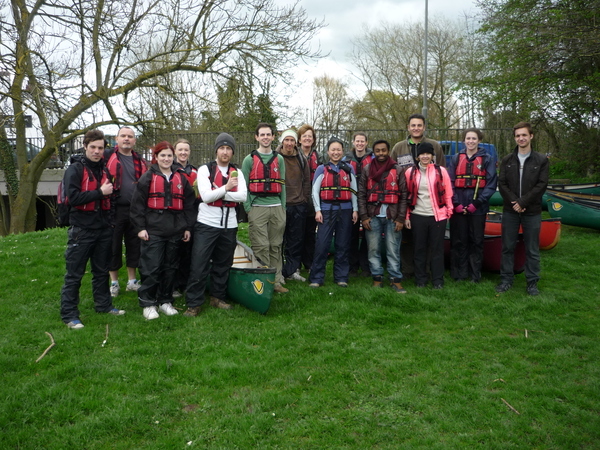 The canoeing trip was run by Experience Adventure and was a 7 mile trip that lasted most of the day. It took place on the River Ure starting at Ripon Racecourse Marina, going past Newby Hall and ending at Boroughbridge – around a 45 minute drive from York. 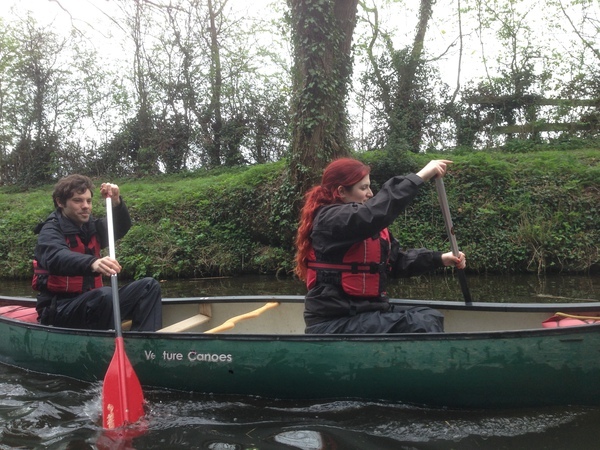 We started with some basic instruction on paddling and steering the boats, then we were off! At first, Michael and I spent most of our time heading into the river bank or banging into our fellow canoeists, but after a while we seemed to get the hang of it. Half way through the day we stopped for a picnic at Westwick lock and had a chance to rest and recover. This was greatly needed as my arms are still feeling the effects of the rowing! One of the great things about living in York is having access to the river and canoeing is just another fun way to enjoy it. I’d definitely recommend the uDare group. They’re a lovely bunch of people and the activities are well organised by group host Sin-Mei who is friendly and welcoming. Check out their Meetup page to see what other events they have planned! uDare York group after a job well done! Thank you so much for coming! It was something different and fun to do for all types of people! Lovely to have met you both and really chuffed that you both enjoyed yourselves 🙂 Hope to see you again!